Two very well dressed children pose in their winter coats and hats at the studio of H. C. Gabriel in Philadelphia, Pennsylvania. The children are posed in a faux outdoor scene complete with snow on the ground and snow covered fences. Herman C. Gabriel is noted in the 1900 U. S. census. The census reveals that he was born in Austria in 1833. He was married in 1873 to Johanna Gabriel. He was living with his wife and 22 year-old, American born daughter, Emma. His occupation is listed as “Photographer”. Herman Gabriel is cited in the American Photographer (1916) for winning second place in a photography competition. This Cabinet Card portrait is in very good condition and has excellent clarity (see scans). 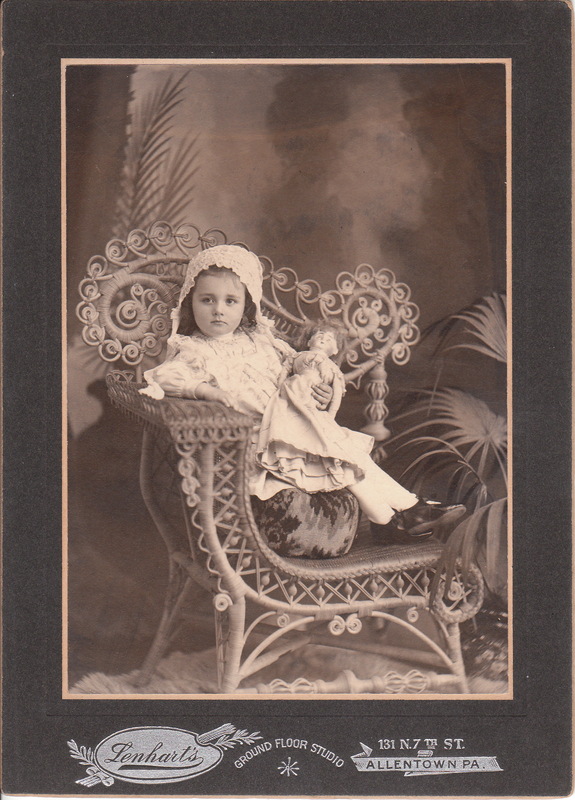 This image is a post cabinet card era portrait of a sweet adorable little girl holding her doll. The child is well dressed and flashing a wonderful smile. This photograph was taken at the Hafer studio in Reading, Pennsylvania. The photo joins one of many images from Reading that can be found in the Cabinet Card Gallery. Edward Egleman Hafer (1843-1925) was a portrait painter in addition to being a photographer. He was born in Berks County, Pennsylvania and settled in Reading in his mid teens. He began his photographic career in Reading at the studio of Captain F. M. Yeager for whom he worked between 1872 and 1874. 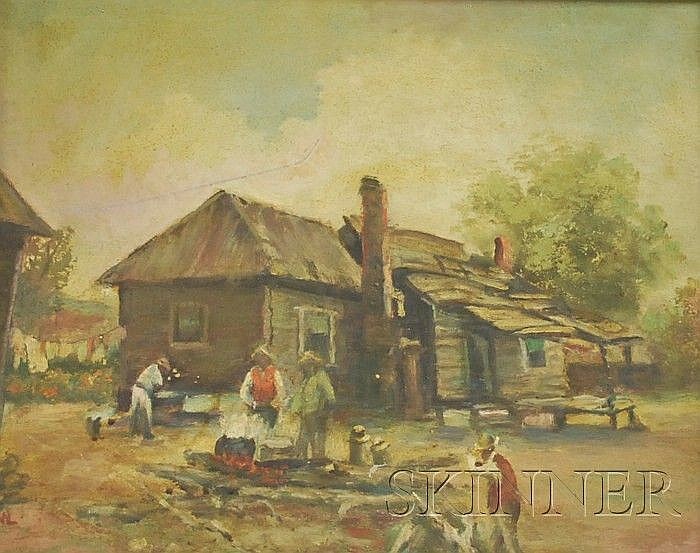 He then bought Yeager’s business and remained at the same address (433 1/2 Penn Street) until 1900. Hafer was married to Amanda Nagle Hafer (1853-1920). The 1920 US census indicates that he was still working as a photographer at a very advanced age. He eventually retired in 1920 and died in Mount Penn, Pa in the year 1925 at the age of 82. He is buried in Reading’s Charles Evans Cemetery. This photograph measures approximately 7″ x 5″. 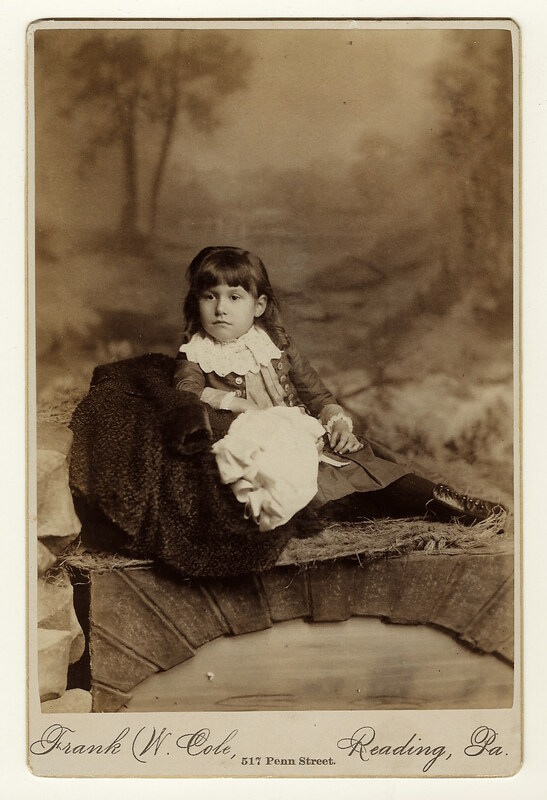 This cabinet card portrait features an adorable little girl while sitting on a platform covered with fake grass. The youngster exhibits a lot of poise for a child her age. Note her lace collar and the multitude of buttons on her jacket. She is holding her bonnet on her lap. The photographer of this image is Frank W. Cole (1857-1912) who operated a studio in Reading, Pennsylvania. Cole was born in Bethlehem, Pa. and learned photography there. He came to Reading in 1883 and opened a photography studio at the address printed at the bottom of this cabinet card. He closed the studio in 1885 and went to work for another photographer (Saylor). According to the information aforementioned, this photograph was taken between 1883 and 1885. A Christmas/New Year’s message on the reverse of the photograph (see below) reveals that this charming girl’s name is Emily. 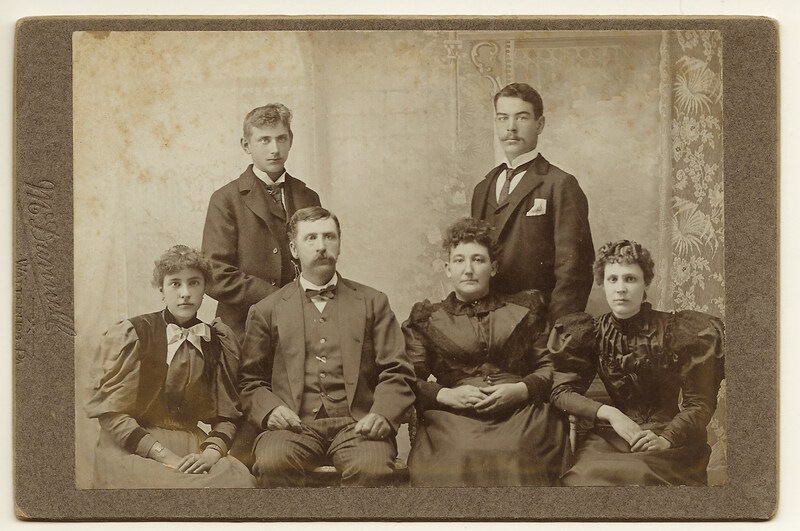 This vintage photograph features a family of six dressed in their finest clothing. The family portrait includes a couple and their two teenage daughters and one teenage and one young adult son. This photograph was taken at the C. A. McDannell’s studio in Wattsburg, Pennsylvania. The photo below shows McDannell’s house. His studio was on the top floor. 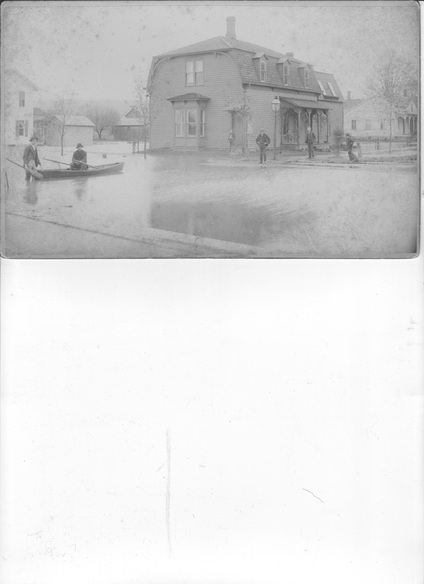 The picture was taken during one of the town’s multiple floods which occurred between 1892 and 1909. Charles A. McDannell (1859-1944) was born and died in Erie County, Pennsylvania. He was married to Jennie Barry. He is buried in Wattsburg Cemetery. The 1900 US census lists McDannell and his 17 year-old son Clyde as photographers. The 1910 US census also lists Charles as a photographer. However, the 1920 and 1930 US census reveals that he had become a postmaster. Wattsburg-tanner.Weebly.com provides a bit of biographical information about McDannell. In addition, the site displays some of his photographs. It is noted that Charles liked taking outdoor photographs. He had a special interest in photographing country life and children. “Photographic Times” (1888) praises a few of his photographs and the “Bulletin of Photography” (1912) reports that he was on the executive committee of the Professional Photographers Society of Pennsylvania. Inscribed on the reverse of this photograph is a family name. I have been unable to search the name due to legibility problems. Any assistance would be appreciated in deciphering the name. ADDENDUM: See comment below. Great genealogical detective work by a cabinet card gallery visitor identified all the members of the family seen in this photograph. Grapes? Paper Bags? When did paper bags get invented anyway? 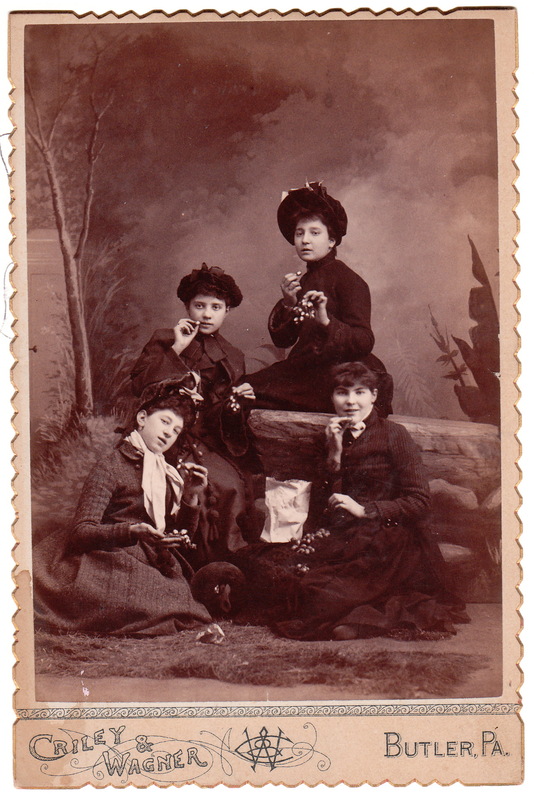 Why did the photographer choose to photograph four teenage girls eating grapes? Is there some kind of symbolism in the image or is it meant to just show four girls enjoying a picnic? 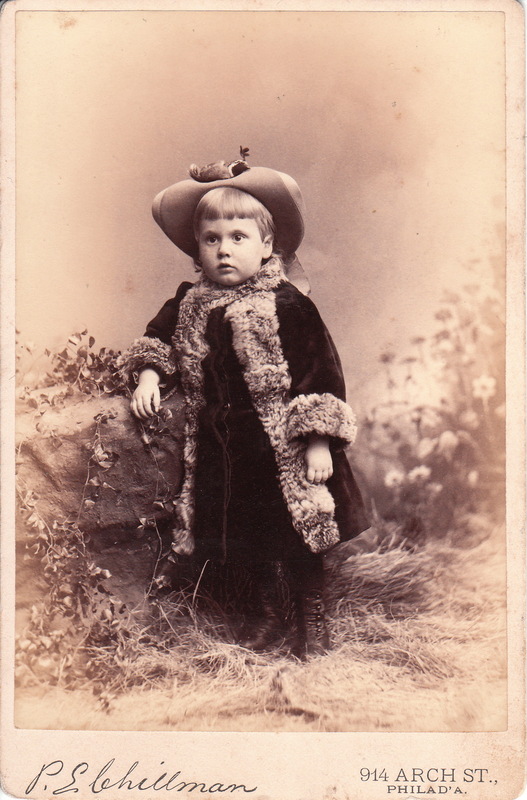 This cabinet card photograph presents a number of interesting questions and I can only answer one of them. Paper bags were invented in 1852. At least that is when Frances Wolle patented the machine that manufactured paper sacks and founded the Union Paper Bag Company. 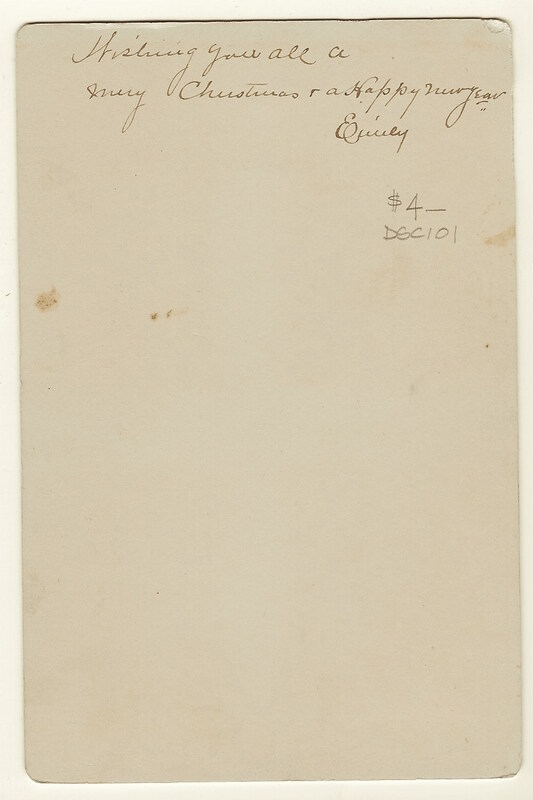 The reverse of this cabinet card has an inscription stating “Stella Pape, 1888”. Stella was actually her nickname. Her given name was Destella L. Pape and she was born in 1872. She was about sixteen years of age at the time of this photograph. 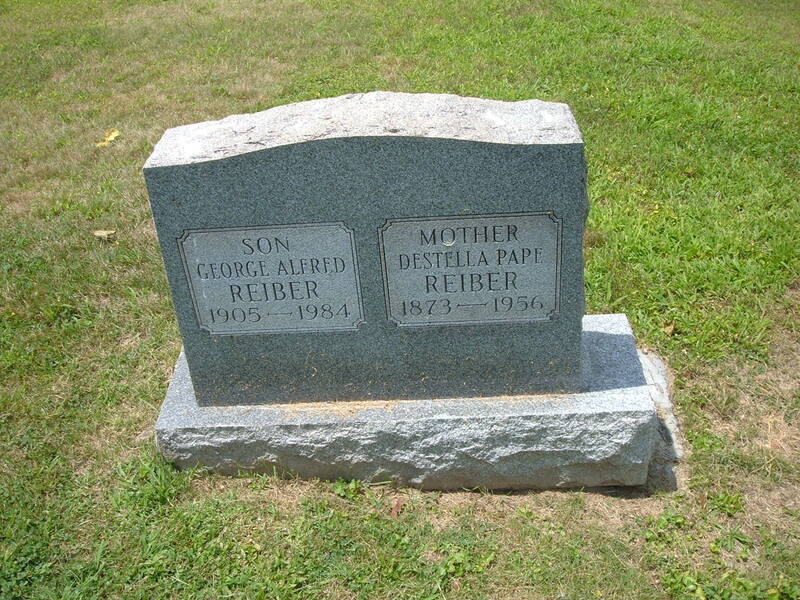 In the 1900 US census she was living with her mother (Mary) and older brother (Nielson) in Butler, Pennsylvania She later married George Reiber who was a man twenty-one years her senior. The couple had a son in 1905 who was named after his father (George). 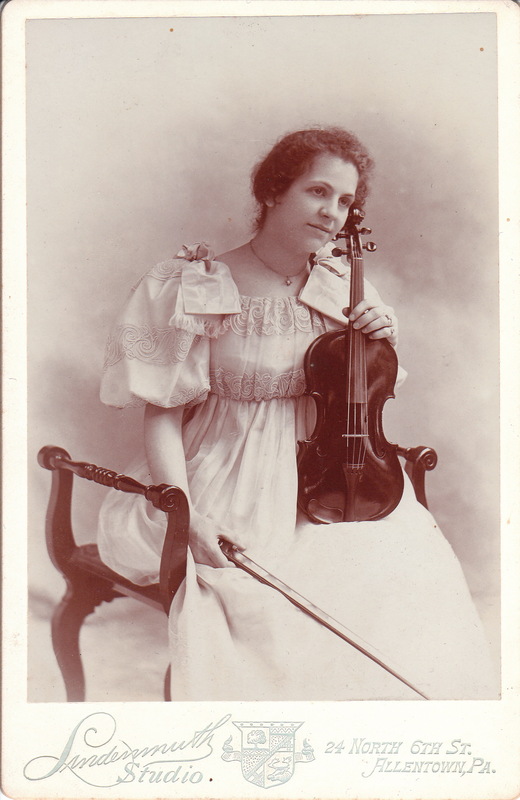 Stella Pape died in Pittsburg, Pennsylvania in 1956. She was buried with her son (see the photograph of her gravestone below). The photographers of this image are Criley & Wagner. To view more of their images, click on the category “Photographer: Criley & Wagner”. 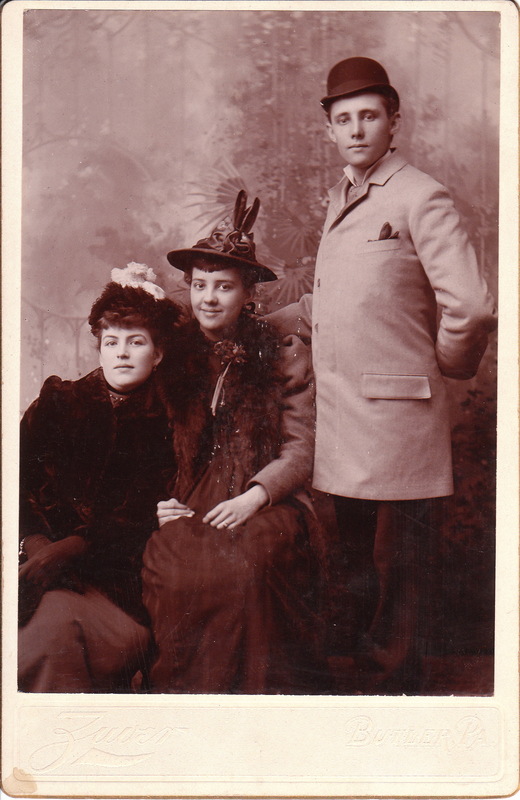 This cabinet card portrait features two young women and a young man posing together at the Zuver studio in Butler, Pennsylvania. The three subjects appear to be friends judging by the amount of affection seen in the photograph. One woman is leaning into the other and the young man has his arm placed behind the pretty woman in the center. The three subjects also appear to be having fun as can be ascertained from the smiles on their faces. All three subjects are wearing terrific hats. Lewis W. Zuver was active in the photography business from the late nineteenth century through the early twentieth century. A help wanted ad for his studio appeared in the Bulletin of Photography (1921). His brother, Leonard Zuver operated a studio in Tionesta, Pennsylvania. His sister, Mary Zuver West ran a photography studio in Bradford, Pennsylvania and specialized in portraits of women and children. To view photographs by this photographer’s brother, Lewis and to learn more about his family; click on the category “Photographer: Zuver”. 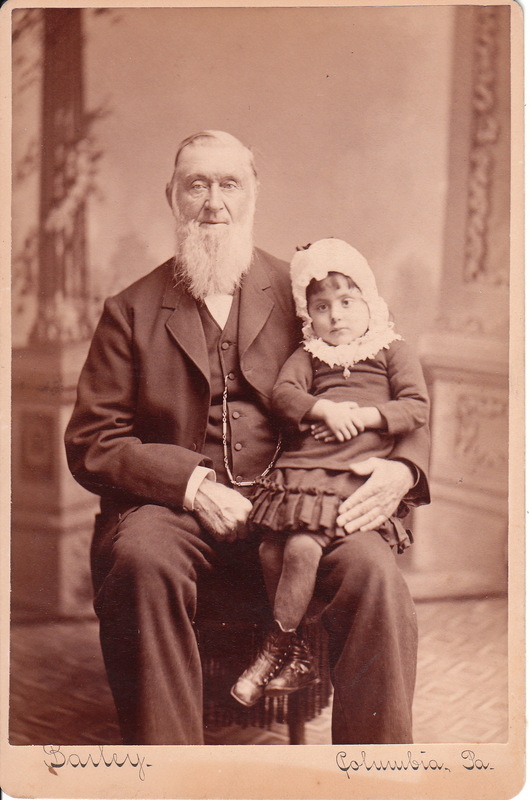 This cabinet card portrait features what is almost certainly a grandfather sitting with his young granddaughter on his knee. Grandpa looks quite proud and his little granddaughter looks very comfortable on her perch. This photograph likely served as an emotional keepsake for either the grandfather or the granddaughter for the remainder of their lives. The photographer of this image is William Bailey who operated a studio in Columbia, Pennsylvania. To view more photographs by this photographer and to learn more about him, click on the category “Photographer: Bailey”. An adorable little girl poses for her portrait at Lenhart’s Studio in Allentown, Pennsylvania. She is wearing a cute bonnet and is clutching her prized doll. A look at her eyes reveals that she is taking in the entire scene around her. She is sitting on a large cushion on what appears to be a wicker chair. To view other images by Thomas Lenhart and to learn more about him, click on the category “Photographer: Lenhart”.